Hidden New Jersey: Who belongs to Newark's Schoolmen's Club, and are they still around? Who belongs to Newark's Schoolmen's Club, and are they still around? Not far from Newark's Liberty Pole are a few more historic markers of varying ages and topics. 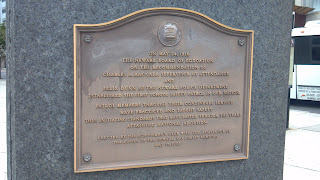 Like the Pole marker, at least one bears the curious legend of being erected by the Newark Schoolmen's Club, with the assistance of the pupils of the city's public school system. 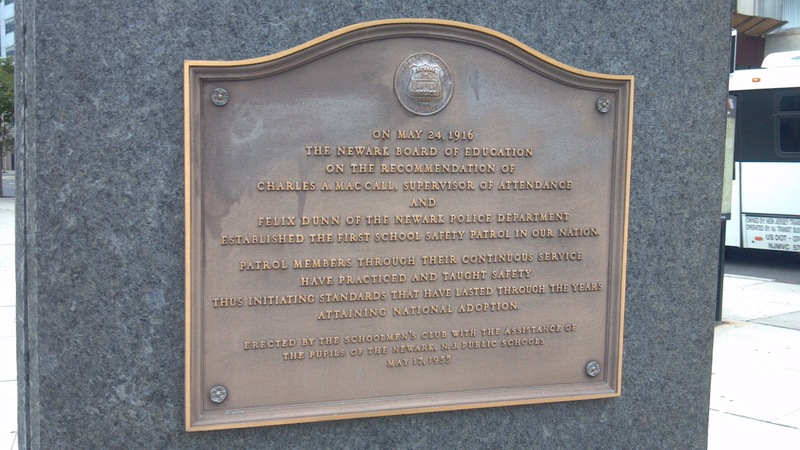 "To inspire the future with a record of the accomplishment of the past, the Schoolmen's Club assisted by the pupils of the Newark Public Schools has, since 1911, celebrated "Newark Day" each year by placing in certain prominent or hallowed locations tablets of enduring bronze commemorating significant events and outstanding personages in the rich history of our city, the "town on the Pesayack" founded in 1666." Wow... one would hope that the Schoolmen might have gotten the author of that passage a primer on run-on sentences. I ran out of breath just typing that. A Google search revealed that the organization had published a book that contained all of the information immortalized on the bronze plaques placed around town. The idea was that "the children of Newark, like the Athenian youth shall leave our city not only not less but greater and better than it was transmitted to them." A noble intent, indeed. The Old Newark website only lists plaques up to 1941. However, the final word on the group may just have come from Charles Cummings, who was, until his death, Newark's official historian. In one of the series of columns he wrote for The Star Ledger, he chronicled the many memorials and statues downtown, also mentioning the Schoolmen's Club. According to the 2004 story, the group had erected historical tablets until "just recently." Whether that means they stopped after the turn of the century or many years before, it's hard to tell. It's admirable that an organization was so imbued with civic pride that they'd make the effort to uncover history and then raise sufficient funds to cast it in brass and post it for all to see. Newark's nearly 350 years of existence have been both tumultuous and productive, and I doubt anyone with knowledge of its history would deny there's a lot to trumpet. I wonder how many of the Schoolmen's plaques are still within view of the general public? I have to believe that a few of the old office buildings have them hanging on their exterior walls. I'll definitely be keeping an eye out whenever I go downtown.